my full attention. My first impressions are what I explore. I love to observe small overlooked moments or an instant of solitude in a public place. I put a lot of consideration and thought into presenting a quick moment. But there are other journeys to take, ones that cover vast dimensions of time and space. These travels take flight not in a jet plane, but are explorations of intuition, emotion, and heart. and my reactions to them. I fell in love with it all. through my oil painting series. my heart out there too. Vianne Korhorn feels fortunate to spend over a month in Paris every year, immersed in culture and art. Back home in the Chicago area, she established an artist salon, in the French style, with lively, supportive discussions. Vianne volunteers at E. Hines Jr. V. A. Hospital, where she teaches Studio Art to Out-Patient Veterans. 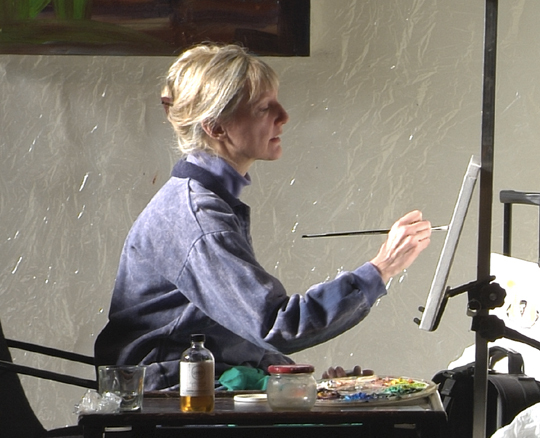 She has earned an art degree, awards, and many commissions. Her paintings are in private and public collections in the U.S. and France. But most of all, Vianne is grateful to live the artist's life. Art of 9: "Two," 2012, Norris Gallery, St. Charles"